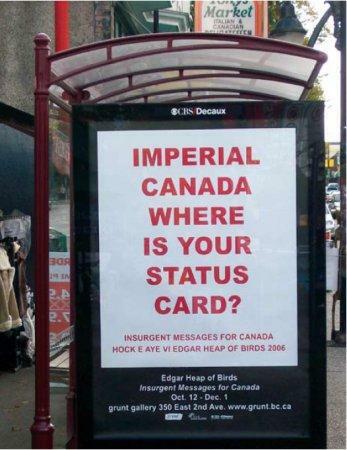 The posters that constitute the artwork entitled Insurgent Messages (for Canada) were created for the Grunt Gallery. The artwork is part of a project incorporating four works, exhibited over the period of a year at the Grunt Gallery in Vancouver and elsewhere. Although the art project that encompassed Insurgent Messages (for Canada) and Native Hosts, Words, Trees, Chiapas / In Honor of EZLN and Wheels: Overlays is entitled Public Art for the Americas, each work is an individual event with a separate title.